Jerry may not have it quite right. According to Karen Raugust at Animation World Network, The Lion of Judah was the first CGI feature produced in South Africa (while not specified there, it is in 3D). Judging by the trailer and promo slides (1, 2, 3), Zambezia will be a mite more watchable - the main characters are well-distinguished, though the backgrounds struck me as being of lesser quality (with exceptions). I think the name references the later-day Rhodesia (now Zambia and Zimbabwe); the Zambezi river flows through it. Oh, weird, I think I vaguely heard about this production a year ago, only it sounded more like a pitch idea to get funding - It must've gotten some! I could've sworn it had zebras in it, but then I did some searching and found another production that Triggerfish might have in the pipe called Khumba. There's still a nagging feeling in the back of my head that there was something a French animation studio was working on that also takes place in Africa... (checks)... Zarafa, maybe? Which came out in February. Yay us. I don't think I've heard of this before today. :/ Or The Lion of Judah. Still it looks a lot better than the animated Jock of the Bushveld that was released here last year. It was also available in 3D. I haven't seen the movie (not this version anyway. I did see the live action one which was pretty good and I read the book a few years back) but I saw the promotional videos and they did not seem appealing at all. Hey all, if you're interested in finding out more, check out our facebook page http://www.facebook.com/zambeziamovie for all up to date info on "Zambezia"! Are you by any chance the creator of that very page? To Mister Twister, yes, I'm from Triggerfish Animation Studios, the creators of 'Zambezia'(or Adventures in Zambezia) and we're currently in production on the 'Khumba', the zebra movie Dronon referred to. Wow... I did NOT expect someone... respectable by... ehm... mainstream society... to post HERE, of all places! Haha! Yes, I was alerted when 'Zambezia' was mentioned. We're an indi studio, based in Cape Town, South Africa, with big aspirations! I don't whether you were able to attend Annecy International Animation Festival where our movie was one of the official selections, which is a great privilege. If you're a supported or indi films taking on the world, then support us! Like our facebook page to be kept up to date with what's happening with 'Zambezia' as well as being able to get some nice visuals from the movie, if you're interested. 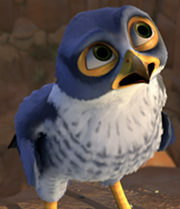 I've seen the short interview/making of/preview for Zambezia. It looks pretty good. I think it can compete with the American animations as well. I hope the promo video gets shown in the US, mostly because I loved one of the director's bits in the interview. He was saying how it's great working with British voice actors and that they can spell! It's colour not color!